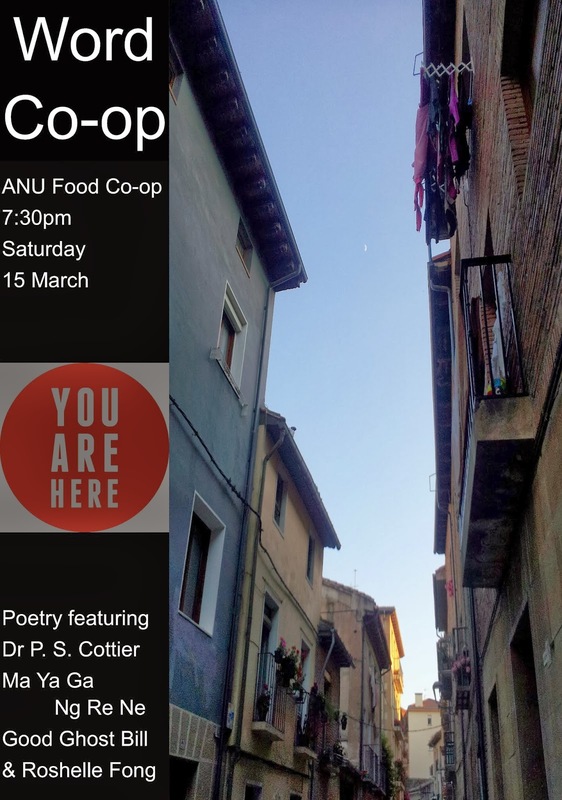 Word Co-op is a bimonthly poetry night at the ANU Food Co-op, this special March edition is brought to you in conjunction with You Are Here. For the evening we have Dr P.S. Cottier, Ma Ya Ga Ng Re Ne, Good Ghost Bill and Roshelle Fong. Chai and potentially even cup-cakes will be available for your delectation before proceedings and during the break. P.S. Cottier has been writing for aeons, but in 2007 she decided that poetry was her main mad discipline. She loves the ability to dwell in words; to play in the vocabulary sandpit with sharpened spade, and a bucket that leaks puns beyond the pale. She likes ideas in a poem as much as sound, which makes her a tad old-fashioned, if not totes eighteenth century. She has three books of poetry published, and wrote a PhD on Dickens. Recently she has discovered the ambiguous pleasures of editing. You can call her Post Script (as she nearly forgot to seek publication). You can call her Peripatetic Similes, if you like big words. You can even call her Penelope Susan (as that is her name). Ma Ya Ga Ng Re Ne, aka Thomas A. Day, is a multi-disciplinary artist, who is currently exploring experiential installations, which seek to synthesise elements of digital and analogue collage, manipulated visuals, sound, and live performance. He has featured as a spoken word, performance and installation artist at Australian festivals, arts spaces and events including the Queensland Poetry, Woodford Folk, Tasmanian Poetry, Brisbane Emerging Arts, Brisbane Fringe and Brisbane Festivals. Good Ghost Bill (aka Bill Moran) was a proud member of the 2011-2013 Austin Poetry Slam national teams, as well as the 2012 & 2013 Austin Poetry Slam Champion and 2013 Southern Fried Haiku Champion. He has has co-directed the Texas Grand Slam two years running, featured at venues and taught workshops nationwide, conducted long-term poetry programs at a local juvenile justice center, as well as released three books and a CD. He is currently the president of Mic Check, a non-profit poetry and spoken word organization based in Brazos County, Texas. Roshelle is a little bit silly from head to toe. She shares an entirely reasonable height of 5'2'' with Reese Witherspoon, who she will one day meet and stand back-to-back with, barefoot. It is probable that this whole-body fist-pump of aligned proportions will shatter both girls' perceptions of perfection. She loves making films and dancing for hours on end until her intestines are very grumpy with her. Roshelle, not Reese. Roshelle can't speak for Reese. Yet. As a zygote she really knew how to work a womb. But enough about the past.